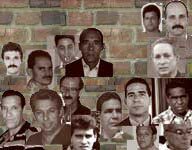 In an attempt to break them of their dignity, Castro dictatorship treats its political prisoners as nothing more than common criminals. One way it does this is by requiring political prisoners to wear inmate uniforms, the same as the rapists, robbers and murderers, as if there is any comparison between these men of conscience and criminals who need to be locked up. Political prisoner Arturo Magín Colomar Puig, imprisoned since 2006 because of his human rights activism, refuses to be treated as a common criminal. Since Feb. 18, Colomar has been on a hunger strike to protest a prison requirement that he wear the uniform of a common criminal, according to a dispatch from independent journalist Roberto de Jesús Guerra Pérez. Colomar's mother, Mindalia Ramona Puig Aran, told Guerra that on a recent visit to the Aguadores prison in Santiago de Cuba, Colomar said he would rather die than wear a prison uniform. When she relayed this to a prison official, he said:"He has to wear the clothes because it is the regulation of the prison, and I do not care that he is a dissident or an advocate of human rights. That issue is already old for us, and I am not interested if he dies on his strike."